Top competitive male tennis players from across the area had the opportunity to play for a wild card into the BB&T Atlanta Open qualifying tournament and compete against some of the world’s top players. 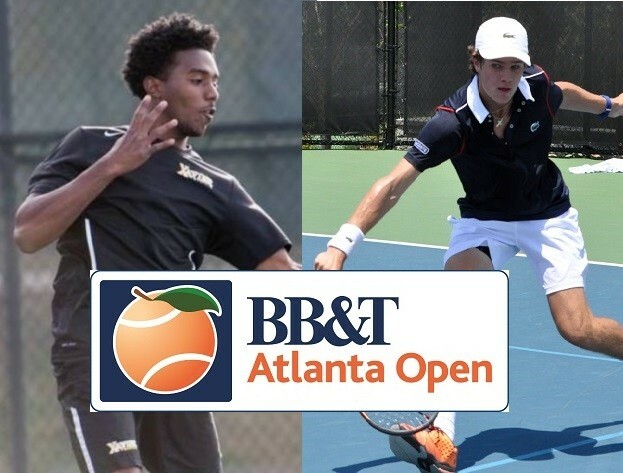 The winner of the BB&T Atlanta Open Wild Card Challenge will be determined after a four-player playoff with Xavier University of Louisiana senior Kyle Montrel against University of Kentucky sophomore Trey Yates and Georgia Tech sophomore Michael Kay versus Trent Bryde of Lifetime Athletic Tennis Academy. In the first semifinal held at 10 am Tuesday, July 21, Montrel upset Yates 6-4, 6-1 on Court 3 at the BB&T Atlanta Open Tournament site. "Trey is a great competitor and I am sure I was the underdog coming into the match," Montrel said. "Just happy to have come out on top." The second semifinal between Kay and Bryde, played at 12:30, saw Bryde overcome blistering heat to defeat the Yellow Jackets star, 7-5, 6-3. "It feels great. Michael is very good player, but we both didn't play our best," Bryde said after his victory. "It could have been a tighter match if he was on, but I am going to play more agressive and try to make a lot more balls tomorrow." The BB&T Wildcard Championship will be held on Wednesday July 22 on Court 3 at 11 am. The winner of this Championship will gain entry in to the BB&T Atlanta Open Qualifying draw, which begins on Saturday, July 25.